Mom and Dad's favorite products are wonderful to remember; Every now and then I'll happen upon something special that I'd forgotten in some antique store, and those wonderful feelings come right back to me. 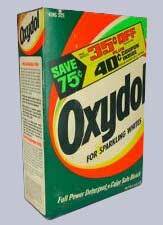 Dad had his favorites, like Brycreem and Goop hand cleaner for the garage, but Mom's prods seemed to rule the roost. 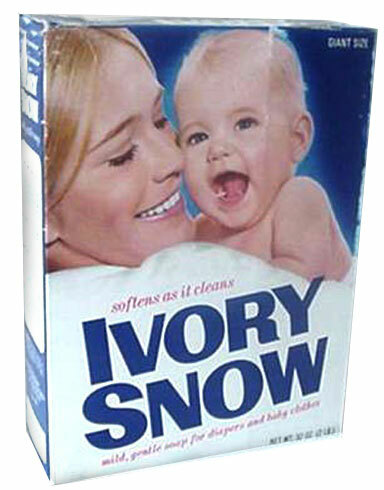 Laundry products got a lot of commerical time during daytime TV, and mom used products like Ivory Snow, Cheer, Oxydol and Tide. Though I was fascinated with Dad's things, like his Old Spice shaving mug and brush, plus the aftershave, and by the time I was in fifth grade, English Leather was likewise fascinating. It was special to watch commercials that pushed the products we used in our house. The commercials and melodic jingles that bounced across the air waves from radios and TV sets made them all the more familiar. If the product advertised was used in our house, its commercial became an anthem of sorts sounding trumpets and waving flags to the wisdom of our very household. 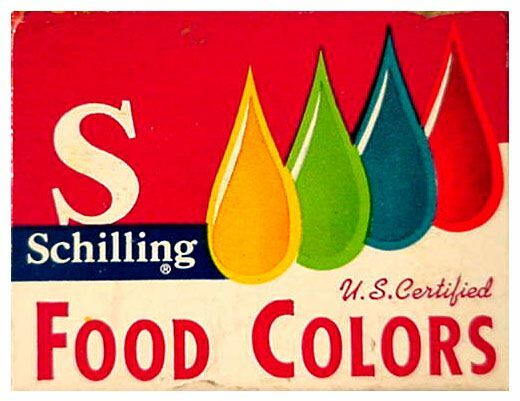 One of my favorites in mom's cupboard was the red food coloring that looked just like blood until it dried. (Then it became a sort of magenta color). I could pull the best jokes on everyone with a bit of well-applied red food coloring. Making people look forward to commercials was quite an accomplishment considering they interrupted our favorite shows. Cereal commercials always had us kids glued to the set, but few advertisers did it better than the folks at Alka Seltzer. The video below contains two of my favorite Alka Seltzer classics from the 60's. Laundry detergent, bath soap, kitchen cleaners, and every other doo-dad under the sun was advertised on TV, magazines, and radio. Many of these items found their way to our household, but only a few remained. Mom used Oxydol Tide and Cheer quite a bit. She used Mr. Clean regularly. Ivory Liquid was another. I really loved the white bottle and blue label of Ivory Liquid. At times I can still recall the scents of those products, and they bring back pleasant memories of our kitchen. The 60's were all about fun, and the products were well-presented on TV sets on the sixties homefront. Commercial jingles, savvy actors and great product endorsement by celebrities was a big part of 60's marketing. It's hard for me to forget great characterizations like Josephine the plumber, or the ever-lonely Maytag repairman. It's a lot of fun for me to browse antique stores and see things I'd completely forgotten about that rested on our shelves, sat in the garage, or was stacked in the laundry/utility room. Everything from syrup to sealant, that we used in our house, appeared on pages of magazines or on television. My parents always went for what had the best prices, then experimented until they found the ultimate product. Breakfast cereal was the most enticing for me, and each week it seemed, a new brand came out that was crunchier, mightier, and better for you than the previous. I have to admit I must have tried the entire gamut of cereal. 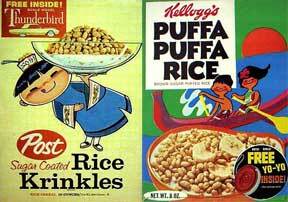 One of my favorites was Rice Krinkles. The flavor was wonderful, though it seemed to disappear from the shelves, perhaps due to the box art. Cold and flu remedies were never much fun, though for a bit, Aspergum interesting with a sour orange flavor that eased up a bit after periods of chewing. I don't recall that the gum had any miraculous healing properties to it. "From the valley of the jolly, HO-HO-HO, green giant!". Green Giant canned vegetables echoed along the air waves with constancy in American households during the 60's. Though it never tasted any better than any other canned vegetable, I always wanted it just because of the Giant. Shake N' Bake was quite the innovation! The commercials were nauseating with country superstar Loretta Lynn makin' "frad chi'ken" in the kitchen with her young daughter asking "Mama, can I help?" 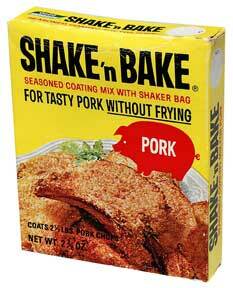 Still, Shake N' Bake was quite a convenience and tasted great! Up there with Hamburger Helper, it was the kitchen staple. 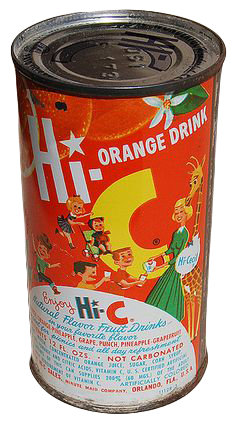 Who among us is to believe that a can of orange drink like Hi-C is actually full of vitamin C? Aw, what the heck, the product gets a pass simply because of its "60's" royalty. Drinks like Tang, Hawaiian Punch and eventually Gatorade were beloved products in our 60's households. Hawaiian Punch won hands down thanks to its brilliant ad campaign with a cartoon of an annoying little islander punching an innocent tourist in the face simply because he'd like a "nice Hawaiian punch". Endorsements by cartoon characters Let's not forget that Popeye ate Spinach straight from the can making us kids think it tasted good made us strong! was another gimmick, but one had to be very careful when listening to them. 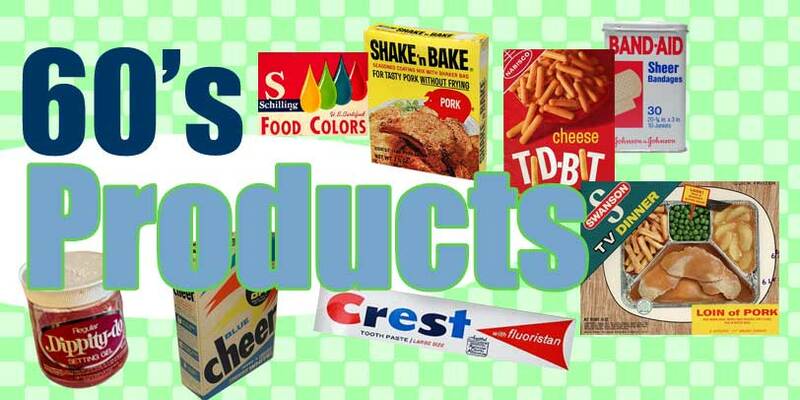 I look back fondly on all of these wonderful products that I was either introduced to, or grew up with. 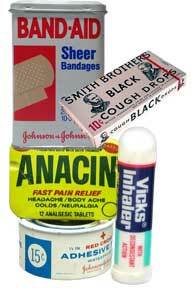 The likes of Jell-O, Brillo Pads, Ban Deodorant, Chocks Vitamins, Kool-Aid, Aspergum, Goop Hand Cleaner, Sucrets Throat Lozenges, Nestle's Quik, No-Doz and Sea and Ski are all among the classic lineup of those wonderful days gone by. In a perfect world, I could sit and list off every product and innovation that came from my era of the 60's, but of course, that's impossible. However, I was around to see the birth of wonderful new things like Tab cola, a new "1 calorie" soft drink, and I witnessed many other innovations such as telephone area codes and postal zip codes.